It’s Fyreslayering time here at the Bell of Lost Souls, and that means we’re going through all the new releases. Here’s a look inside the box of the new Magmic Invocations. Call down fire. Call up fire. Basically if you want lava, fire, or runes–this is the box for you. The Fyreslayer’s Magmic Invocations are the fiery manifestation of the faith of the Zharrgrim priests. These are not Endless Spells cast by a wizard–but they function much the same. Like Khorne’s prayers, these are invocations that can’t be dispelled, but seem to sputter out on their own at random. Each one has its own unique purpose, and as you can see in the video, these models are pretty easy to put together. 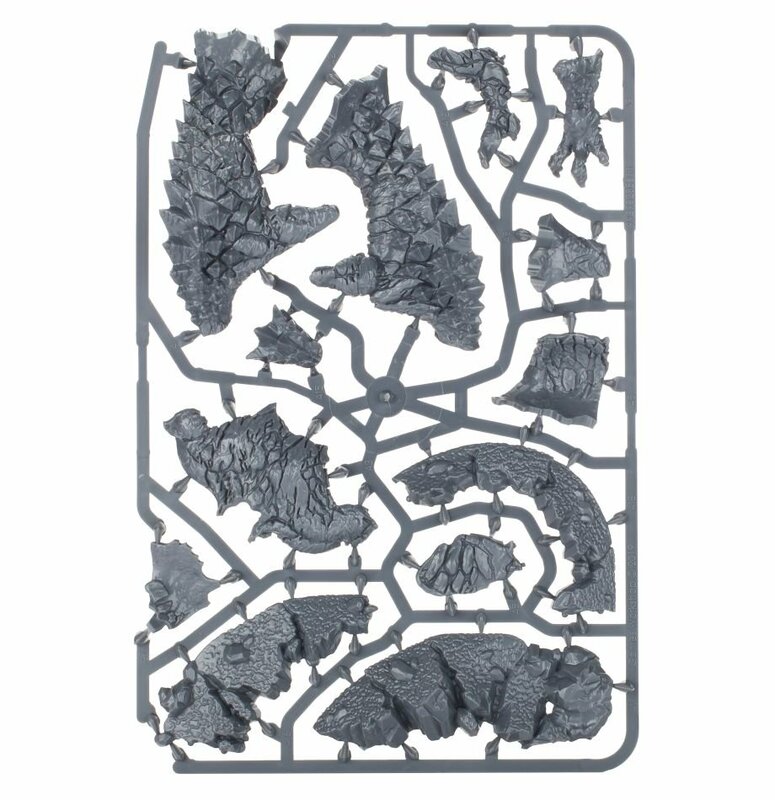 Two sprues has everything you need to build your lava spells and unleash them upon an unsuspecting battlefield. Well. I mean if you’re playing Fyreslayers, they’re probably a little suspecting. Especially since these spells add some interesting tools to the Fyreslayer toolbox. First off there’s the massive magmic monster, the Molten Infernoth, who crashes through enemies and has the potential to dish out some Mortal Wounds. 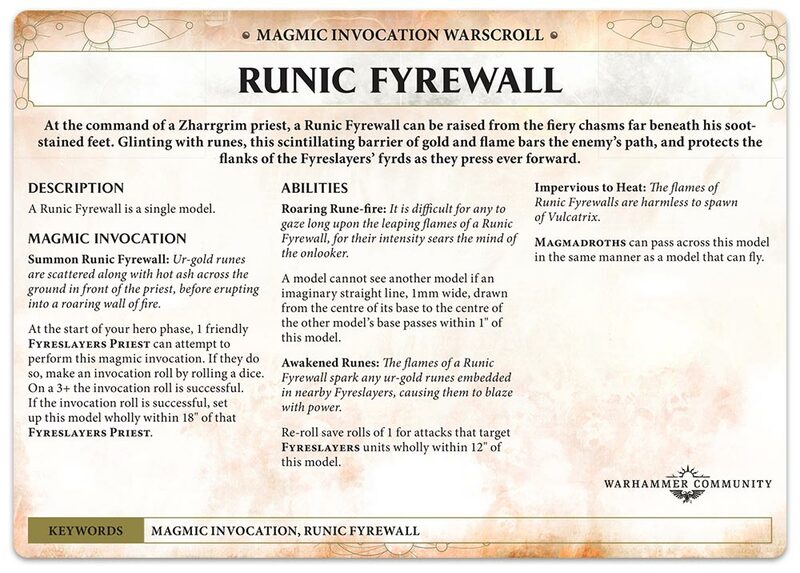 Then there’s the Runic Fyrewall, which is such an interesting defensive tool. Depending on your positioning with it, you can protect a whole section of the battlefield. The Runic Fyrewall blocks line of sight and boosts the saves of your Fyreslayers near it, giving you unexpected resilience in crucial moments. 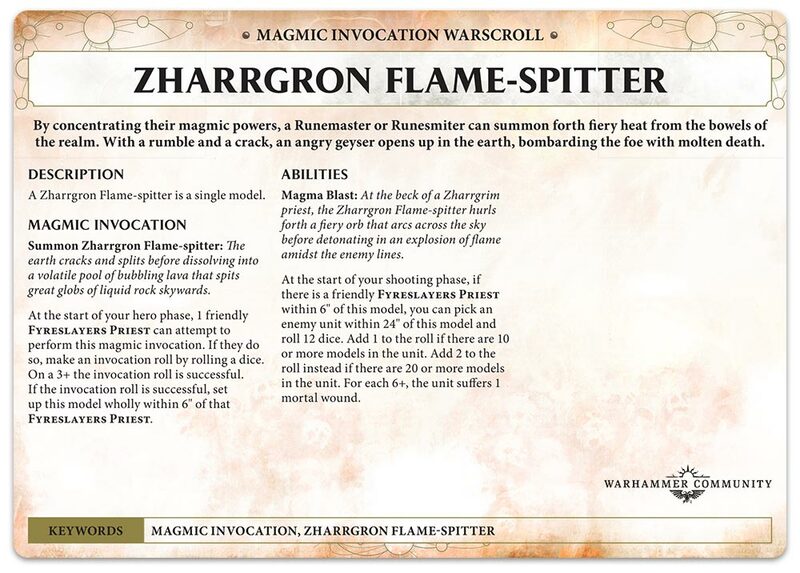 Finally there’s the Zharrgron Flame-Spitter, which is a lava geyser that adds another ranged weapon to the Fyreslayer arsenal. 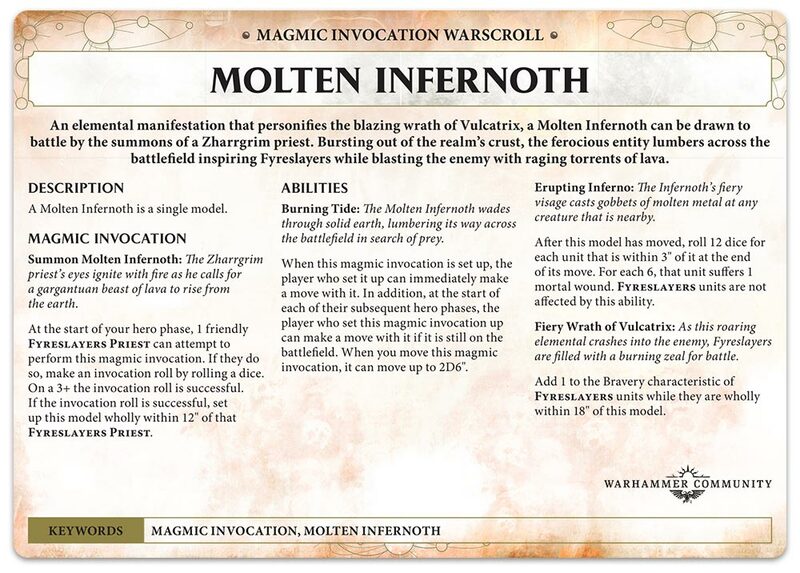 This one is a little more reliable than the Molten Infernoth, in that you can target big mobs of models and have a much better chance at dishing out Mortal wounds. And that’s the Magmic Invocations. They’re up for pre-order now, and will be out in the wild by Saturday. Enjoy!